One of the things that I’ve noticed on my journey with the fried egg is how many of golf’s personalities, architects and leaders grew up playing golf at a local municipal golf course. These courses provide a place where golf’s youth are welcomed with open arms and learn the basics of the game. One of my guilty pleasures has been finding local public courses that get it and provide strong architecture that promotes fun, playability for all, and are most importantly, are affordable to play. A place that checks off all those boxes is Dallas’ Stevens Park Golf Course. Run by the City of Dallas, Stevens Park Golf Course is one of the city’s oldest courses. Originally designed by Jackie Burke Sr (yes, the Masters Champions Dad) in 1924, the course is just a 10 minute drive from downtown Dallas. Stevens Park Golf Course winds through an affluent neighborhood and is laid out on a tiny 110 acres. Over the years, Burke’s layout became overgrown and out of date because of the technological advances in the game. The city wanted to upgrade and improve the course for the modern game and commissioned Trey Kemp and Colligan Golf in 2011 to do the job. What the city got back was a unique, fun and affordable track that Kemp masterfully routed through the constricted borders and streets of the Stevens Park neighborhood. I was impressed with how Kemp was able to highlight the great property’s natural land movement and even uncover some vistas that Stevens Park didn’t even know they had while infusing character and uniqueness by employing multiple squared off greens. Ultimately giving Stevens Park a lasting memory for its golfers. 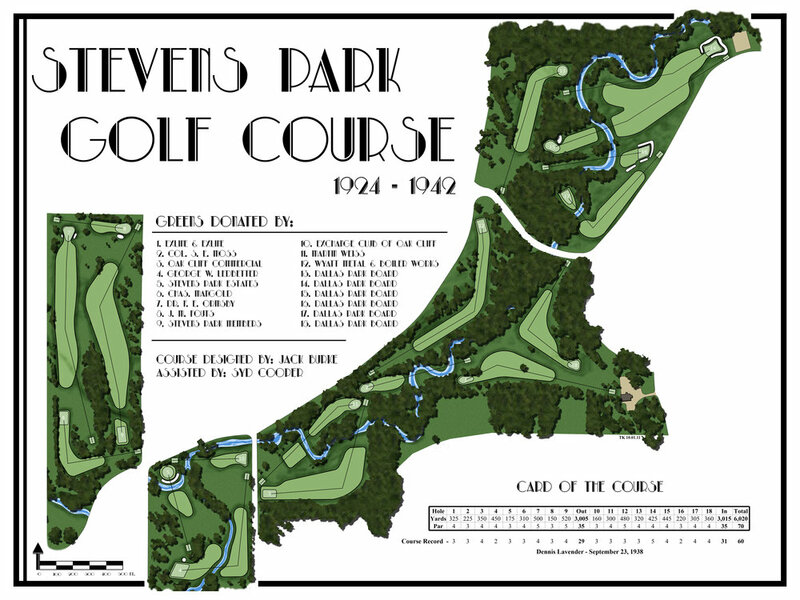 The 2nd at Stevens Park is your quintessential short par 4 and has shades of the 10th at Riviera. From the tee box, the line seems to be right at the green, but upon further examination, the proper place to drive your ball is down the left side to setup the best angle to approach the green which is set on a 45 degree angle from left to right. The short and dramatic par 3 4th gives players their first look at Stevens Park’s unique squared off green complexes while offering a nice view of the Dallas skyline from one of the courses’ highest points. The 4th has a lot of flexibility as its wide and shallow green allows for a multitude of pin positions. The wind can be menacing here and make it very difficult to hit the shot the yardage needed to make your birdie. I love the concept of this hole, but the execution has fallen short because of tree plantings up the left side which obscure the view of the great strategic nature of the hole. In Dallas, they have an ordinance that requires a tree to be planted for every tree taken down and the thirteenth is a casualty of that ordinance. The hole’s fairway is split in half by bunkers which force a player to choose whether to play it safe up the right side or thread the needle up the left with the reward of a significantly short approach and better angle. The corridor is nearly 70 yards wide which allows for this great strategic design to be employed! For those who love a great reveal, the 15th is your cup of joe. After the par 3 14th, golfers climb a hill to get to the 15th tee where they are treated to an unobstructed view of the Dallas skyline and a fun downhill dogleg left par 3. A good drive shaped from right to left will leave a short iron approach to the squared off and angled green. One of the more talked about holes at Stevens Park is the par 5 16th which offers a twist on Tillinghast’s Great Hazard concept. The key to the hole is a strong tee shot which finds the fairway and positions a player to carry the expansive ravine which bisects the fairway and spans 80 yards. If a player misses the fairway, a decision of whether to go for it or layup is made. Successfully carrying the ravine leaves a short wedge shot to a green guarded by a deep bunker, and laying it up will leave a semi-blind long iron shot that is very tough. In my opinion, a great and thrilling golf hole. I fell in love with the short par four finisher because of its naturalness. Kemp was able to set the fairway bunkers into the hill to make them look as if they had been there forever. The hole itself is a dandy because it raises doubt as to what the correct play is. Driver can get close to the green but leaves a difficult uphill pitch shot to a undulating and unique green. Meanwhile, a long iron will take the bunkers out of play but leave a full wedge to a hard sloping green that requires great spin control to hit the ball close. All in all, a fittingly fun and thought provoking finisher for a dandy course. If you are headed to Dallas and looking for a place to play, I would definitely recommend Stevens Park. Besides being affordable, close to city center and fun to play, I was able to get around it quick, playing in less than four hours on a Saturday morning. Love golf? Sign up for the fried egg newsletter and never miss a beat! Sign up for our newsletter and stay up to date with the golf world and get our latest articles delivered!